The rock art of Petroglyph National Monument dates back thousands of years. The carvings include people, animals, geometric figures and more complex images, each with distinct meanings and context and intricately tied to the overall sacred landscape. To the local Pueblo groups — the Cochiti, Jemez, Sandia, Santa Ana, and Zia — the petroglyphs are a place where messages are conveyed between ancestor spirits and the living. The Pueblos’ ancestors chose this spot because of the dramatic alignment of five volcanoes — a place “born with Mother Earth’s great labor and power,” according to Weahkee. Since the first drawings were made on the rock, the petroglyph area has been used as a place for holding ceremonies, gathering medicinal plants, and offering thanks. Traditional ceremonies still take place today. During the mid-20th century, as Albuquerque expanded, the area became littered with trash, imitation rock drawings, and bullet scars from target practices. The 1980s gave birth to a movement to protect the petroglyphs, and the area was designated a National Monument in 1990. Soon after, however, John Black, a local landowner, declared his intention to build a 19,000-home development west of the park. The development required extending the Paseo Del Norte highway, a proposal supported by part of Albuquerque’s City Council and Republican Sen. Pete Domenici. In 1998, the U.S. Senate, overriding a recommendation by Interior Secretary Bruce Babbitt, approved a bill that removed a key 8.5-acre corridor from the jurisdiction of the National Park Service and returned it to the city, enabling the city to move forward with building the highway extension. The SAGE Council, a Native-led citizens’ group, and other opposing groups including the Sierra Club, the National Trust for Historic Preservation, the SouthWest Organizing Project, the Southwest Network for Environmental and Economic Justice, the New Mexico Archaeological Council, and the New Mexico Environmental Law Center opposed the project because it would involve moving some boulders with petroglyphs, thus destroying a sacred site, in addition to disturbing religious practices at other nearby petroglyph locations. They argued that increased access to the rock art brings graffiti, target practice, and vandalism. Opposing groups also attempted to argue against the road and the housing development for environmental reasons, but once the land became city, not federal, property, a full environmental impact study was not required. In 2001, the coalition succeeded in blocking all four of the state legislature bills that appropriated money for the highway, and in October 2003, voters rejected a bond measure that included the Paseo del Norte project. These tactics, however, only stalled the inevitable; ultimately, opponents lacked the legal standing to stop the construction. In October 2005, district court Judge Linda Vanzi ruled that the city had proved there were no prudent and feasible alternatives for the highway and allowed construction to begin. She emphasized that the city still needed to comply with the New Mexico Prehistoric and Historic Sites Preservation Act in mitigating the damage caused to the sacred rock art. The city attempted to consult with tribes about relocating petroglyphs that were in the road’s path, but the tribal organizations felt they could not cooperate on a project that was fundamentally against their beliefs. Ultimately, the city decided on its own how to relocate a set of nine boulders, some with petroglyphs and others that were smoothed from either grinding or touching for prayer. After several more failed legal actions, road construction was completed in June 2007. In a small consolation to tribes that have seen their sacred area disturbed, the city of Albuquerque announced plans in February 2010 to declare 40 acres of land adjacent to the Petroglyph National Monument to be “open space,” protecting it from development and allowing low levels of recreational use. In total, over half of the land designated as Petroglyph National Monument is owned by the city or the state, leaving it vulnerable to development and other encroachment such as aircraft fly-overs from the airport west of the monument. Trash continues to be dumped throughout the petroglyph area, and motocross riders ignore fenced-off areas as they ride through. As with other sacred places, the challenge facing the tribes and their allies in the Paseo del Norte case was in convincing the public and lawmakers that tribes cannot just point to specific pieces of rock art that are sacred: the entire area is a coherent whole and needs to be understood and respected on its own terms. Moving individual boulders was only a solution to those who do not understand the philosophy of land-based spirituality. The case also shows the danger of allowing land in a federal national monument to be controlled by local governments, which will often succumb to the pressure of development. McKay, Dan. “40 Acres in Petroglyph Will Be Annexed as Open Space.” Albuquerque Journal, February 4, 2010. National Park Service. 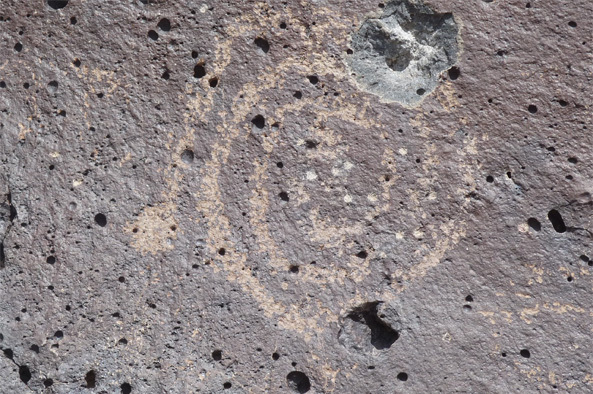 “Petroglyph National Monument.” NPS.gov. Norrell, Brenda. “Pueblos Struggle to Protect Petroglyphs.” Indian Country Today, May 5, 2004. Schoellkopf, Andrea. “A Long, Hard Road; After years of controversy, Paseo extension to open next week.” Albuquerque Journal, June 15, 2007. Schoellkopf, Andrea. “Mayor Pledges Dec. Start for Paseo; Judge’s ruling gives Albuquerque a partial victory but says questions remain.” Albuquerque Journal, October 12, 2005. Schoellkopf, Andrea. “Petroglyph Move Needs Tribal OK; Ruling Applies To Paseo Extension.” Albuquerque Journal, October 15, 2005. Schoellkopf, Andrea. “Petroglyphs Moved for Paseo; Crews finish shifting rocks a few hundred feet on Wednesday; no damage reported.” Albuquerque Journal, December 29, 2005. Schoellkopf, Andrea. “Unending Effort; Area around Petroglyphs still covered with debris.” Albuquerque Journal, July 3, 2010. Weahkee, Bill. “Petroglyph Area is Sacred Place for New Mexico Pueblos.” La Pintura Vol 23 No. 2, Fall 1996.